When it comes to pure versatility, Hornady’s Frontier line of ammunition is hard to match. 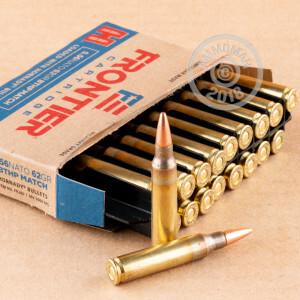 This military grade 5.56x45 cartridge was produced at the Lake City Army Ammunition Plant in Independence, MO, where it was loaded to US Military standards, so if you are a veteran you’re likely to find this round’s performance somewhat familiar. This round features all of Hornady’s own quality components, including their select reloadable brass casing and sensitive Boxer primer. 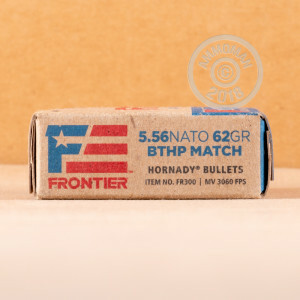 Its 62 grain Match bullet features a boat tail design, which significantly raises its ballistic coefficient to convey higher accuracy, less sensitivity to the adverse effects of cross winds, and greater momentum delivered upon impact with the target. As a hollow point, this bullet is able to inflict a wide and deep wound channel during penetration as well, so you may effectively implement it for hunting and self-defense as well as training, target practice, and good old-fashioned plinking.